Can TomTom's iPhone App Compete With a Standalone GPS Unit? TomTom's new GPS navigation application for the iPhone may sound appealing, but its true cost and capabilities are still a mystery. The app costs $100 and allows the iPhone to function as a real-time navigation device that provides turn-by-turn directions. The software is only part of the cost. For the best GPS experience with your iPhone you'll need to buy the optional Car Kit, which includes a car mount, charger, additional GPS antenna, microphone, speaker, and audio-out jack. TomTom says it will offer a bundle, but the cost has not yet been officially announced. Unofficially the cost is predicted to be $90. When you factor in the software and hardware kit, what's the real cost? Another question is: how cumbersome will all this extra gear be? Will you have to dedicate a tiny new gear satchel for the TomTom iPhone car accessories? Will it get lost under your car seat and be squished into your glove box? Don't be surprised if the total cost of the TomTom iPhone app is a lot closer to that of the company's standalone GPS units. For $120 at Best Buy you purchase a TomTom One XL Portable GPS unit that includes a windshield mount, power adapter, and turn-by-turn voice prompts. That GPS unit affixed to my window and plugged into my lighter is looking better and better. Another negative regarding the TomTom iPhone app is it doesn't include text-to-speech capability, which means it can't announce street names. While I suspect this feature will find its way into future versions, it doesn't exist in the initial release. Personally, I'd rather hear "Turn left at Green Street," not "Turn left in 200 feet," particularly while driving in congested cities. The iPhone is still a phone. And that means there's a good chance you'll need to answer a call while the TomTom app is voicing directions. What will you do? Take the call and mute the app? Or let TomTom talk and send the call to voicemail? Anti-texting laws are one thing for drivers, where does using your phone for navigation fit in? Could a dash-mounted iPhone running the TomTom app be considered "texting" and illegal to use in some states? While the long-term outlook for standalone GPS units is probably bleak. 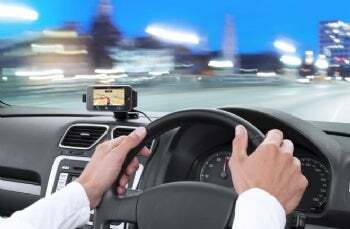 It won't be long before you can't buy a new car without GPS as a standard feature. In the interim, a dedicated navigation devices still offer advantages over smartphones. Lastly, TomTom isn't the only app that allows you to turn your iPhone into GPS device for your car. CoPilot Live, which costs $35, offers many of the same features.